Surreal Fertility Dance Painting Signed by Artist in Peru, "Fertility Dance"
"In this painting I'm depicting a man and a woman with their bodies entwined and showing happiness in a surreal setting that is full of mysticism. The woman's fertility is evident in her pregnant body. 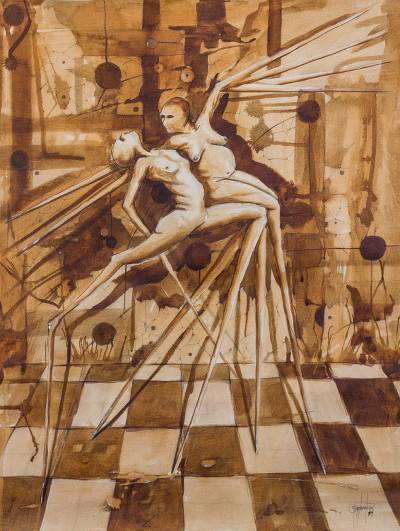 The couple's joy and dynamism come together in a dance rich with emotion," explains Juan Sandoval of this admirable composition. The Peruvian artist combines walnut stain and pencil with oil and acrylic paints to set the mood for romantic fantasy. Titled "Danza de la fertilidad" in Spanish.